The Capital Asset Pricing Model, explained in Chapter 3 of our reference Resource 1 [ Introduction to R for Quantitative Finance ], leads us to the concept of Beta that is a measure of the risk of a particular security when compared to the risk of the market in general. The risk free returns, represented in our case by bank interest in India. logreturn1 <- function(x) log(head(x,-1)/tail(x,-1) that is different from what is given in the book. 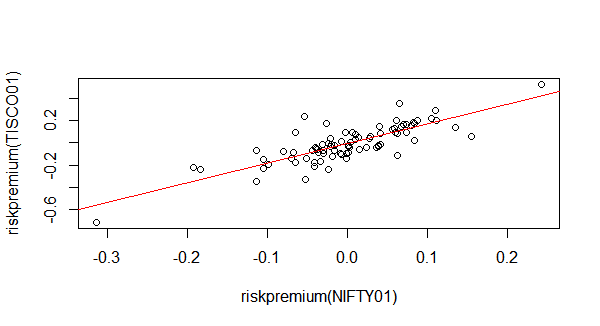 The program runs and we note that the beta calculated from ratio of covariances [ 1.7685] is the same as that obtained from the regression coeffient [1.768501] of the risk premium. The same analysis can be carried out using a spreadsheet and this is demonstrated in this Google Docs spreadsheet. The beta values calculated using the ratio of Covariance to Variance is very close to the value obtained using R (1.7691 vs 1.7685 ). However slope obtained in the spreadsheet (1.7905) is a little different.